A stroke can come without much warning, but there are a few ways to tell early on if one may be occurring. To help protect your senior loved one in the event of a stroke, the staff at Home Care Assistance, a leading provider of senior home care in Harrisburg, suggests watching for these specific signs. Weakness and drooping on one side of the body may indicate a stroke. Because each half of the brain controls half of the body, the side of the brain affected by the stroke can cause problems in its coordinating side of the body. If you notice any muscle weakness, ask your loved one to raise his or her arms above the head. If one arm can’t be raised as high as the other, 911 should be called. Sudden problems with vision, which include difficulty seeing out of one or both eyes, seeing double, blurred vision, or blindness, can be indicative of a stroke. If your loved one complains of unforeseen vision difficulties, a doctor should be immediately contacted. When a stroke occurs, blood flow to the brain is unexpectedly cut off. This can result in confusion due to the mental pathways that control behavior becoming jumbled. If your loved one is suddenly having trouble understanding you, he or she may be experiencing a stroke. A sudden, severe headache often occurs during a stroke due to the loss of blood and oxygen to the brain. If your loved one doesn’t typically complain of headaches and gets one seemingly out of nowhere, further steps should be taken to determine if there is a serious stroke risk. The same brain problems in a stroke that cause confusion also can result in slurred speech. If your loved one has difficulty communicating with you, it could be due to blood flow being cut off in the brain. Asking him or hera simple question, such as name or birth date, can help determine if the speech difficulties may lead to a stroke. 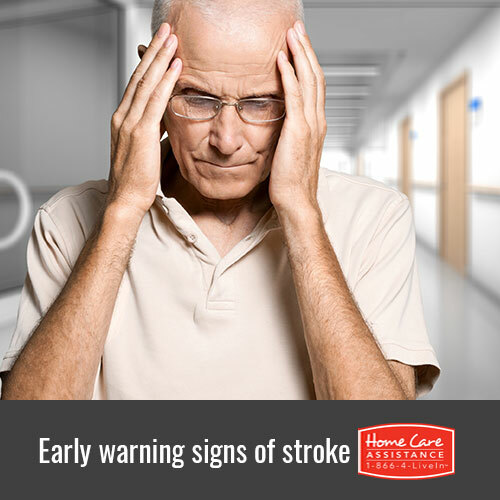 Even if you have been paying attention to the warning signs, sometimes a stroke is still unavoidable. If your loved one has experienced a stroke and needs post-stroke care in Harrisburg, turn to Home Care Assistance. Our hourly and live-in caregivers can assist with a wide variety of daily activities, including mobility assistance, transportation to and from doctor’s appointments, and providing companionship and emotional support to help stave off common post-stroke feelings like loneliness and depression. For more information on our in-home stroke care services, call one of our knowledgeable Care Managers at (717) 540-4663 to schedule a complimentary in-home consultation.